This version has been replaced by birthday reminder 3. 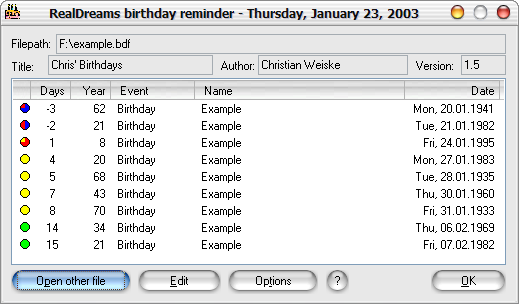 RD birthday reminder runs at windows startup and shows you the next events in an own defined time span. The occasions are marked by different colors so that you can see what is long away and what occurs in the next days. You can import & export data from various programs, including Microsoft Outlook! Birthday reminder is freeware. This means, you may use and distribute it for free and don't have to pay for it. Want to be notified on updates? Subscribe to the newsletter!